Wraped or unwraped in moist paper. 1) Seeds wraped in moist tissue paper geminate by 2nd day. 2) Seeds not wraped with moist paper but placed on moist tissues are slow in germination. 3) Fully developed seeds (bigger seeds) germinate earlier. Small seeds (Jiu Jee type) no development even by the 4th day. Durian seeds normally germinate in 7 to 8 days. 95% after 10 days. Trees from seeds can grow up to 2 metres after 3 yrs. Small seeds will take longer time to germinate. Wounded seeds will screte a mucous and are highly susceptible to oxidative browning. Soaking seeds in antioxidant and then grown on charcoal containing media with 1.0mgl NNA (a napthalene acetic acid) or IAA (Indole-3-acetic acid) and 1.0mgl Kenetin can resolve the problem. Organic manures or fertilisers should not be used as they are conducive to P.palmivora infection. Seeds can be coated with fungicide to resolve such problem. 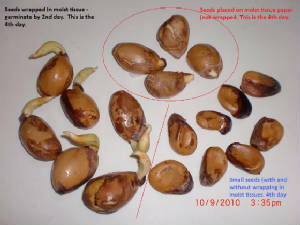 Durian seeds have short viability period. Seeds are unable to withstand chilling or freezing. If seeds are stored at 36C degree viability is lost after 6 days. Seeds are best thoroughly washed. The flesh and aril be completely removed with scroching pad and then wrapped in moist tissue papers. My personal experience shown that D24 seeds germinates just within 2 days if humidity is maintained. 95% will germinate after 3 days! See images above. Exposing seeds to direct sunlight would reduce viability within hours though germination is rapid and easily accomplished. Personally observed that in a whole fruit of Jiu Jee (flatten type seeds), there is one that is fully developed. This prticular seed germinates whereas all the flatten seeds will not. See photo on the left.